Step outside to unwind on the sand beach. Enjoy the umbrellas and sun loungers for a relaxing day at the beach. 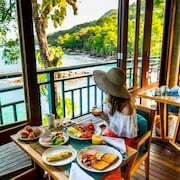 At Hilton Seychelles Northolme Resort & Spa, pamper yourself with a treatment at the full-service spa or have fun in the sun with activities like snorkeling and kayaking. Dining is available at one of the resort's 2 restaurants and guests can grab coffee at the coffee shop/café. A bar/lounge is on site where guests can unwind with a drink. A computer station is located on site and wired and wireless Internet access is complimentary. This luxury resort also offers an outdoor pool, a steam room, and a fitness center. Limited complimentary onsite parking is available on a first-come, first-served basis. A total renovation of this property was completed in 2015. 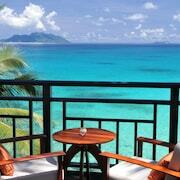 Hilton Seychelles Northolme Resort & Spa is a smoke-free property. 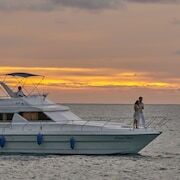 This Mahe Island resort is on the beach, 1 mi (1.6 km) from Beau Vallon Beach, and within 6 mi (10 km) of North East Point Beach and Trois Freres Trail. 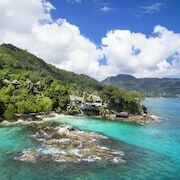 Seychelles National Botanical Gardens and Stade Linite are also within 6 mi (10 km). Catch some rays on Hilton Seychelles Northolme Resort & Spa's private sand beach or spend the day relaxing at the full-service spa. Then enjoy a meal at one of the resort's 2 restaurants. All 56 rooms boast jetted tubs and offer free WiFi and furnished balconies. Living rooms and 24-hour room service are standard, as are LCD TVs with satellite channels. Weekly housekeeping is available. 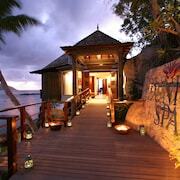 Hilton Seychelles Northolme Resort & Spa offers 56 air-conditioned accommodations with DVD players and minibars. Rooms open to furnished balconies. Accommodations offer separate living rooms. Beds feature premium bedding. LCD televisions come with premium satellite channels. 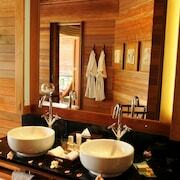 Bathrooms include separate bathtubs and showers with jetted bathtubs, bathrobes, slippers, and complimentary toiletries. 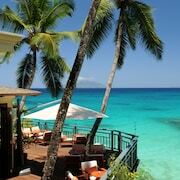 This Mahe Island resort provides complimentary wireless Internet access. Business-friendly amenities include desks and phones. Additionally, rooms include espresso makers and complimentary bottled water. A nightly turndown service is provided and housekeeping is offered weekly. Hilltop Restaurant - Overlooking the ocean, this restaurant serves breakfast and dinner. Guests can enjoy drinks at the bar. Open daily. Les Cocotiers - Overlooking the ocean, this fine-dining restaurant specializes in international cuisine and serves dinner only. Guests can enjoy alfresco dining (weather permitting). Open daily. Oceanview Bar Restaurant - This beach bar specializes in international cuisine and serves lunch and dinner. Guests can enjoy alfresco dining (weather permitting). Open daily.